BikeTrials and a Fistful of Blisters: A Monty Sponsored BikeTrials Team in Malaysia? Yesterday, I had the opportunity to meet up with the Malaysian distributor of Monty bikes, Humphrey of Guan Chow Sdn Bhd through Kevin of Tat Seng Bicycle Centre. Guan Chow Sdn Bhd is based in Ipoh, Perak. 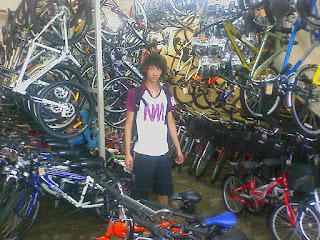 They are also the manufacturer of the widely available Exitway bicycles. Coincidentally, before I even found out about the sports of BikeTrials, I bought an Exitway to ride cross-country in 2007... LOL. And in early 2008, I used the Exitway to learn the basic skills of BikeTrials like track-stands, pivoting and hopping. In early 2009, I had heard that someone was bring in Monty trial bikes, but I had no idea who. And with an exception of a few, not many bicycle shops even dared to carry the Monty trial bikes (Monty Kamel 218 and 219) in their stores. When I was at Tat Seng Bicycle Centre in Kota Kemuning looking for Ah Chun for a set of roller chain and to replace my Monty 221PR's rear wheel spokes, he mentioned to me that his boss (Kevin) knew the distributor of Monty bikes who was looking for a trial rider to sponsor. Basically, they wanted to promote BikeTrials in Malaysia through events and roadshows, and so he asked me if I knew of anyone whom might be interested. Straight away Syarul and Aris came to mind, but they wanted someone who can perform BikeTrial tricks and feats... in the end, I suggested Wong Xu. Wong Xu has had the experience performing for TV shows in China, and locally in LimKokWing and UKM. So, taking that into account, Wong Xu should be the best candidate. And so last Tuesday, I arranged for Wong Xu to meet up and demonstrate his BikeTrials skills to Kevin of Tat Seng Bicycle Centre and Humphrey of Guan Chow Sdn Bhd. 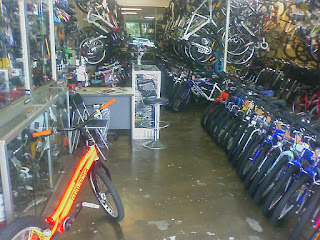 Tat Seng Bicycle HQ in Cheras. 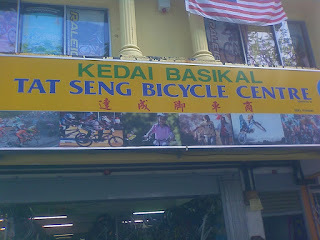 Tat Seng Bicycle shop front. A photo of Wong Xu in the shop. I took a short video of Wong Xu demonstrating BikeTrials. Humphrey was interested in promoting Monty for BikeTrials in Malaysia. He did mentioned that he was preparing to bring in riders from Monty, Spain, to conduct demos and roadshows. If he is, then I hope he will bring in Ot Pi or Dani Comas... LOL. Humphrey also said that he will let Wong Xu know if he will select him as part of the sponsored team. In the meantime, he is also looking for riders to make a Malaysian BikeTrial Team. This team will be conducting roadshows throughout Malaysia to promote BikeTrials. Well, if he is, then I suggest he start off with Syarul and Wan Aris, and with Wong Xu as a guest star trial rider. I hope to hear from Humphrey and Kevin again soon regarding BikeTrials. Maybe, they will be willing to set up a BikeTrial park... ah... if only... LOL.